On a warm and sunny afternoon in August 2018, Flint Optical Co. was abuzz with activity. A small, talkative youngster flittered about as he waited with his mother to meet with the eye doctor in back. At the opposite end of the rectangular waiting-area-and-showroom, a young man quietly perused an assortment of eyeglass frames arranged in neat, well-lit columns along the small shop’s north wall. Meanwhile, owner Bill Pierce finished up with a customer who needed to replace a pair of damaged frames. After discussing options and costs with Pierce, and two men then having reached an agreement on a new pair, the satisfied customer voiced his enthusiastic approval – “My man!” – punctuated with a handshake between the two. Flint Optical, 518 S. Saginaw St., is an institution in downtown Flint. Founded in 1965 by well-known businesswoman Julie Pejakovich – “an avid supporter of downtown Flint, offering her advice and counsel to all who could influence development and revitalization of the Central City area,” according to her November 2009 obituary. Pierce and his wife, Sonia, bought Flint Optical in 2007. 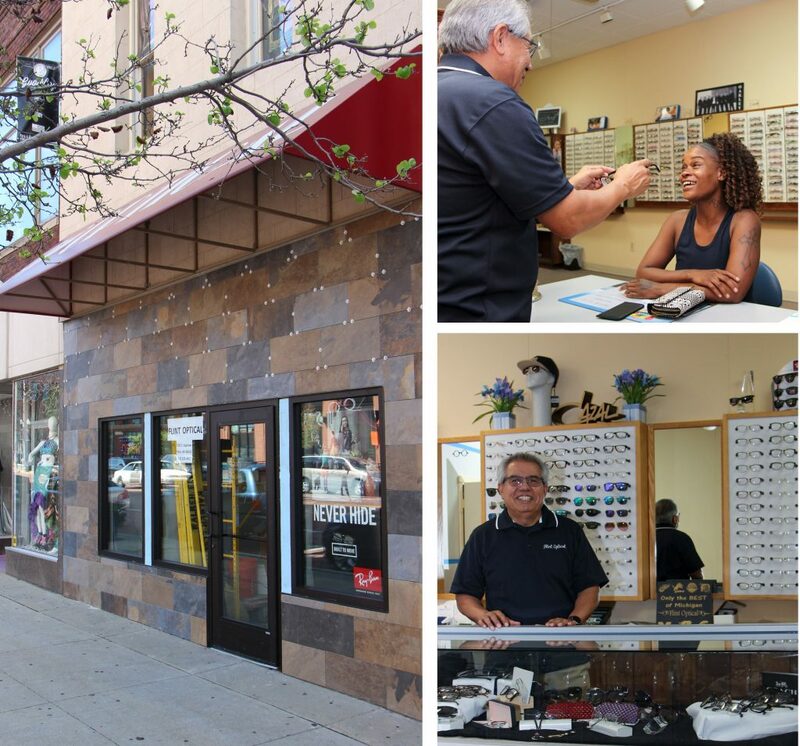 The new owners have worked hard to maintain a tradition of excellence while offering new styles of frames and lenses, adding new optical equipment and, most recently, investing in a new exterior and vestibule. The façade, which was recessed a few feet creating a coved entrance, was bumped out and made flush with the adjacent storefronts on Saginaw Street. The dated brown brick veneer is being replaced with contemporary tile. Inside, the slightly expanded interior will contain a workstation on one side of the vestibule and a children’s area on the other side. The passageway will provide shelter from the cold and rain for customers awaiting rides. “It was long overdue,” said Pierce, about the renovations, slated for completion in September. He added the updates were driven in part by the new investments that are occurring elsewhere in downtown Flint. The shop also had come to be seen by some as rather antiquated, said Pierce. He recalled an amusing encounter from a while back. “Someone was walking by one time, a young guy, a student, and he asked isn’t that just a place for old people?” said Pierce, laughing as he remembered the exchange. Far from it, in fact. Pierce said business is on the uptick, including traffic from college students studying here from abroad. “We’ve gotten a lot of business from international students from Saudi Arabia, India, Thailand and Nigeria,” he said. 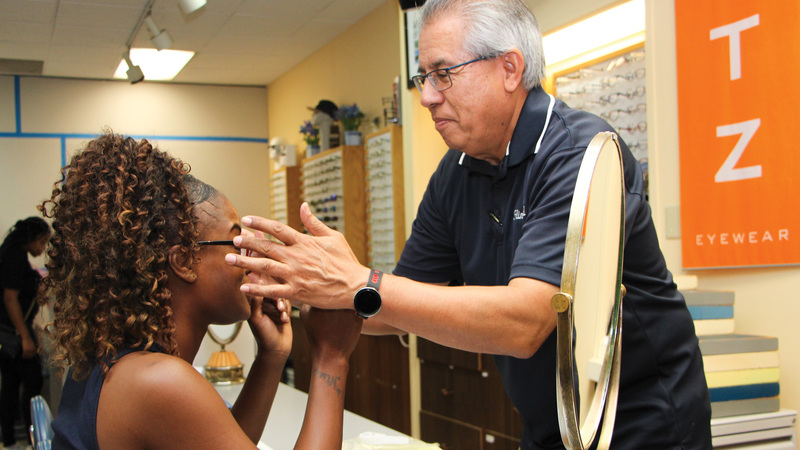 Flint Optical has six employees, some of whom alternate between full- and part-time status during the year. Pierce, an optician by trade, subcontracts the exam facilities to two doctors – Drs. Rose Purdy and Francis Stone – who provide the vision-care services at the location. Although not originally from Flint – he’s a Cass City-native and attended Ferris State University in the early 1970s – Pierce is continuing the shop’s involvement in the civic life of downtown Flint. Flint Optical is a member of the Downtown Small Business Association, and he expressed a strong bond with his neighbors, including GoodBoy Clothing, The Torch Bar & Grill and Sectorlink in Buckham Alley. “That young man next door (referring to GoodBoy Clothing) is doing some terrific things,” he said. Flint Optical also worked with Gazall, Lewis & Associates, Architects, Inc. on the building renovation and offers frames from Flint-based Article One Eyewear. And in keeping with the spirit of Flint Optical’s founder, Bill Pierce is a community booster who relishes the location. “This is a great street for us,” he said.